The Chief Justice of the Alabama Supreme Court is under fire for taking the position that a federal judge’s ruling striking down Alabama’s same-gender marriage ban is irrelevant. Judge Ginny Granade of the U.S. District Court for the Southern District of Alabama ruled that the Alabama Marriage Protection Act and an amendment that made it part of the state’s constitution were both unconstitutional. She later clarified that her order applies to all government officials statewide and not just to the defendant in the case, the state attorney general’s office. The letter also advised probate judges not to issue marriage licenses to same-gender couples, saying that to do so would be in violation of state law. In an interview with AL.com. 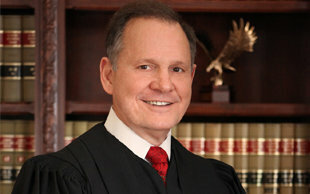 Moore said that state courts are not required to follow decisions by federal district or appeals courts, although he called those decisions “highly persuasive.” According to Moore, only a ruling by the U.S. Supreme Court would be binding in Alabama. and disrespect for the dignity of the judiciary and undermining public confidence in the integrity of the judiciary. The SPLC has a history with Moore: In 2002 it was part of a lawsuit that challenged the constitutionality of a Ten Commandments monument that Moore placed in the state judicial building. When Moore refused to remove it, the Alabama Court of the Judiciary removed him from officebut he was elected Chief Justice again in 2012.